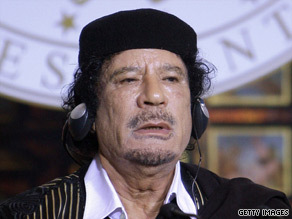 Libyan leader Moammar Gadhafi is in the U.S. for the first time in 40 years. He’s here for the U.N. General Assembly, is staying at an undisclosed location, and wants to receive visitors in a tent in Bedford, N.Y.
Until 3 years ago, the U.S. considered Gadhafi a sponsor of terrorism. And just last month, Gadhafi stirred up anger when he welcomed back the Libyan man convicted of the Pan Am Flight 103 bombing.